Remember that one time, when I attempted vintage shopping in Birmingham and it went moderately downhill? 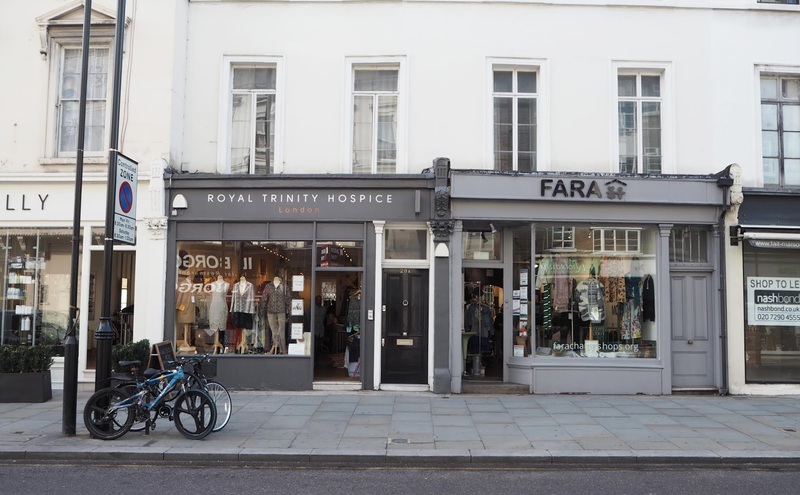 Well, I've ventured once again into the world of sustainable fashion and vintage shopping the other day in Kensington, when The Indytute*, offered me the chance to go on a guided tour around the local charity shops. The Indytute is an online platform that offers unusual gift experiences and fun day outs in London such as roller-skating, rope aerobics, afternoon crafting and upcycling workshops or bespoke charity shopping tours in Hampstead, Kensington or Dalston. I've known London now for 20 years and it never fails to impress me. Exploring never gets boring and even after all this time, I can always discover new sides and perspectives of my favourite city. I decided to go charity hunting in Central London, as I thought this would be an interesting area to explore fashion-wise. Known for its high-end clientele, posh streets and impeccable houses, I assumed that Kensington would mainly be an area of recycled designer brands and chances were high that today might have been the day to find that “true” vintage item. On a crisp and warm Autumn afternoon, I met up with tour guide Sanna and a group of five interested bargain hunters to explore the area and see Kensington High Street from a different fashion perspective. Sanna used to live in London and would regularly scan the area for special vintage finds. From clothes, to record stores and even furniture, Sanna knew all the places worth going to. We started the two-hour tour directly on Kensington High Street where you can find the usual: Oxfam, Cancer Research - you name it they are all there. We went straight into Cancer UK and the familiar rummaging started. Vintage or charity shopping is a bit like a box of chocolates - you never know what you'll be getting. After less than 10 minutes scanning the rails, amongst Primark and Warehouse dresses, I found a black Moschino skirt with a red heart print. Reduced to £35 – unfortunately not in my size, but not too bad for a start. The next shop was the Octavia Foundation next door which turned out to be a little treasure trove for nice second-hand finds. After tugging into the rails of clothes and carefully selecting through the labels, I found a cute cotton skater dress from the brand Snow Traffic. The cotton dress had a lovely girly touch with its light colours and turquoise applications and the round neckline was an additional bonus. This would have come home with me straight away a couple of years ago, but since I’ve changed my style and want to shift away from skater dresses, I had to hang this one back onto the rail. My next find was a very unusual and special piece. Attracted by its bold colour combination, I unearthed a brown cotton dress with mustard yellow circles. The pattern reminded me very much of Yayoi Kusama’s artwork and my first bet was that the dress must have been somehow linked to the Japanese artist in some way. Turned out this dress was the centrepiece of Finish designer Mika Piirainen for label Marikmekko in 2009/2010. Known for its bold colours and standout patterns, the label only works with high-quality fabrics which can make their dresses retail at over £250 easily. This one found in the Octavia Foundation shop came £12. This was a very interesting piece of clothing, as Sanna and I fell instantly in love with it and I researched it straight away in the shop to evaluate its potential value. I wanted to know where it came from and what story it had to tell, so once we’ve discovered that this was an actual piece of high-quality designer clothing, we’ve decided it had to come home with us. This was a great feeling, as usually, I get very disheartened when I search through the rails of charity or vintage shops and then I see Primark or H&M dresses retail at the same price as if I would have gone to the original shop. Finding something, that was of high quality and, you know one of those special finds that was actually decent and at a bargain price, made me confident that I slowly but surely developed an eye for those rare gems. Further down the road, we went into two more shops. Geranium was a random collection of literally everything and nothing: there were furniture, old jewellery next to vintage crockery and clothes stacked onto each other all combined with a distinctive smell of old, worn and used items in the air. It was an unusual shop and after having a look through the coats, I found a brown Mulberry jacket at £40. Not as good as the Marimekko dress but still surprised to find that many designer names on Kensington High Street. The small red charity shop on the other side of the street next to watchmaker Henry Hallpike turned out to be disappointing. After having a look through the rails with nothing particular standing out, we’ve decided it was time to take the bus and switch locations. After a short ride, we ended up on Gloucester Road. Here one half of the group decided to check out the offer in the Oxfam shop, whilst Sanna and I were more intrigued about Fara and the Royal Trinity Hospice on the other side of the street. Both shops were incredible and a vintage shoppers dream. Small but very cute, stuffed from bottom to ceiling with the most beautiful pieces mostly designer brands and unknown labels. Here you could truly find some unique and timeless pieces and literally spend your entire Sunday afternoon discovering one gem after another. I loved the shabby chic style with the wooden flooring, the English country style wallpaper, hidden rooms and all the things that waited to be explored and to be found. An old fashioned standing mirror completed the cliché of a perfect vintage shop for me, so it took me quite a while to get out of there. I’ve not found or bought anything during the tour, I just wanted to be open to the experience and learn as much as possible about my own shopping behaviour – like I did when I went to Birmingham. The afternoon went over way too fast and Sanna has been an incredible guide, knowing a lot of labels and fabrics and she’s given me some great tips how to spot a “true” vintage find amongst the usual clutter. Because, if we’re honest, most of the shops have a lot of contemporary clothes donated and to find that typical 1950 Burberry teddy coat that was only available in a limited edition which is still in great condition today and at £40 a bargain or that LV handbag from the 1920s that has now developed a distinctive patina is very hard to find – especially if you don’t know the brands, the collections or in general the fabrics and how they’re supposed to alter over time. Especially if you’re like me a vintage virgin, it is super helpful to have a knowledgeable guide with you. Not only will you be able to be taken to “the hot spots” but also you have someone you can discuss your finds with. Sanna and I spent at least a good 15 minutes debating over the Marimekko dress and the material and its quality before we’ve decided though it’s not vintage, it is still a very good bargain find and one of us will take it home and love it for the next 20 years. On the tour, I’ve not only learnt how to sharpen my eye for what is a good find and what is junk but also about sustainability with our clothing. Charity shopping will always be a long process, as you have to go through the labels, assess the quality and at the end of the day, you may not come home having bought anything. Whereas if you go to the High Street and you know exactly what you’re after, you can shop targeted and more straight-forward. 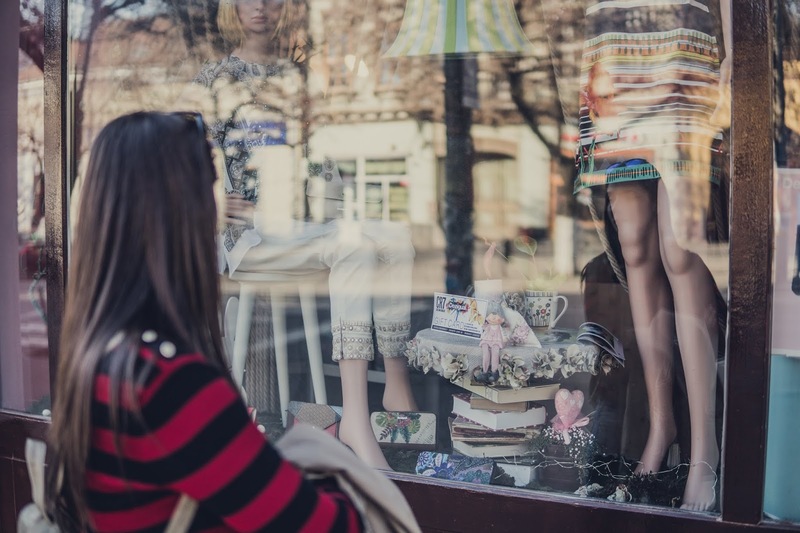 In the long term though, spending an afternoon in the shops and be more selective with your items can reduce the high amounts of throw-away/one-season fashion plus don’t we all want to build that quality wardrobe in which each piece has character, will make you feel amazing and bring you long-term joy? * I was gifted the experience by The Indytute in exchange for an honest review. All opinion are my own.